*Using Random.org’s True Random Number Generator, these winners were selected by using the number order in which your comments were left. Congratulations to carolee888 and Leslie! I’ll be contacting you via e-mail for your mailing addresses and then getting your copies of DRIFT out to you. Thank you EVERYONE for reading my review and leaving your comments! I really appreciate it. So what are you reading today? Did the loss of an hour throw a wrench in your reading schedule? I’m about 30% into Jodi Picoult’s new novel, The Storyteller, and I am really liking it. I hope you are enjoying whatever you are doing today. I have neglected my sewing projects for two days, so I’m heading into my studio for the day. Happy Reading! I am not very well versed in politics, government or military history, but I do enjoy listening to NPR, watching national news broadcasts every evening and the occasional talking head shows, including The Rachel Maddow Show. I had downloaded the audiobook version of her book DRIFT: The Unmooring of American Military Power last fall but hadn’t listened to it yet. Then, out of the blue, I received a nice email from Jessica over at Crown Publishing a few weeks ago. She offered me a copy of the new paperback version of DRIFT. 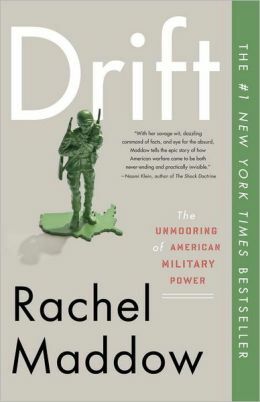 I quickly accepted and after some pleasant email banter with Jessica, receiving my copy of the book and diving into the book, I am ready to share my thoughts on DRIFT: The Unmooring of American Military Power. What a history lesson! I did finally listen to a bit of the audio version while sewing, since you can’t “read” and “sew” at the same time, and that helped to set the pace for reading the book and not approaching it like a text-book. I am not a regular reader of nonfiction so I was a little nervous, but there was no need to be. Maddow’s conversational story telling style of writing made for an enjoyable read. Going into detailed depth on topics that run the gambit from Thomas Jefferson and his thoughts on the young U.S. Military and how to manage reserves and active duty members, to Ronald Reagan’s presidential campaign and then administration, to Vietnam and LBJ’s fear of stirring unrest within the country, (instead of calling up the military reserves who were trained and had chosen to be in the position of fighting for their country, he upped the numbers of a draft, sending fresh troops half way around the world to a living hell where hundreds of thousands made the ultimate sacrifice), to the United States role in today’s wars and developments in Afghanistan and Iraq over the last decade. It’s an incredible number of points in our nation’s history that is discussed here. Dusted with her humor and wit, Maddow has written a book with great thought and in my opinion, balanced opinion without preaching. I loved one part in particular. At the end of the book she has made some suggestions, in bullet point format, to our leaders and to us, as American citizens, on how to get back to what is important and what could work to make us a more united country once again. I think the most important quote of the book, and a great way to sum up the message Maddow is trying to get across to her readers, and really our government leaders, begins the epilogue. Maddow has selected a quote by Admiral Mike Mullen, chairman of the Joint Chiefs of Staff, 2007-2011. Having friends who are members of our great military forces, and knowing that a small percentage of my other friends have little knowledge of what sacrifices these people and their families make on a daily basis for our country, this book really hit home with me. 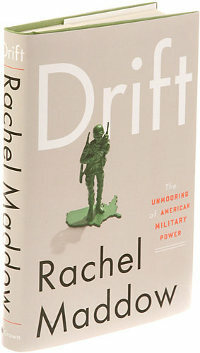 If you would like an in-depth, understandable, yet conversational recap of our military, this country and the world they effect, and has been effected by, then pick up or download a copy of DRIFT: The Unmooring of American Military Power by Rachel Maddow. * I am hosting a giveaway here at Planet Books of two copies of the new paperback edition of DRIFT that comes out today, March 5th, 2013. Please leave a comment below sharing your favorite news show by midnight, Saturday March 9th PST, and you will be eligible to win one of my giveaway copies Jessica from Crown Publishing has provided. Thanks Jessica! To finish… or not to finish? That is the question. 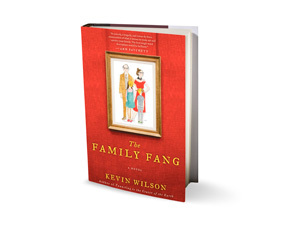 I’m 42% into reading The Family Fang by Kevin Wilson and I’m faced with a decision I need to make, and soon. Do I keep reading, although I don’t feel attached to the story, some of the characters and I feel like I’ve plateaued out, or do I keep going and maybe take another two weeks to get through? I think I just answered my own question. I have such a hard time with the guilt I feel when I don’t finish a book I have invested a good chunk of time in, but that’s how I end up falling off the reading wagon. I have to be more assertive and realistic with myself and just let things go when the time is right. In this case, the time is here. The Family Fang had potential! A story about a brother and sister who were unwillingly, and sometimes willingly, subjected to participate in their parent’s odd public acts of live art as they were growing up. Then as adults, brought back together with their parents due to times of change and tragedy in their lives. Their parents angered me every time the story focused on them and their antics. I did like the way the story moved from present day to the family’s past where the parents had taken their kids to some far off small town to execute their live art events. Most of these live art events were not art in my opinion but I let the story be told. The present day story lines were good too, actually. I just got bored and tired of waiting for something to happen. I believe something should happen in a book earlier than 42% in. So, with that all said, I don’t think The Family Fang is a bad book. I think it is a good story full of good ideas, but I’m looking for something better than that in my reading experiences this year and in years to come. Is that so wrong? Before I Go To Sleep, or as Hubby said, “50 First Dates meets Memento” was a thrilling and gripping book. (Thank to Lisa from Books On The Brain and TLC Book Tours for “telling” me to read it NOW.) It’s also the first book I have finished since last spring. It was just what I needed! Before I Go To Sleep is the tragic but somehow realistic story about Christine, a woman suffering from extreme amnesia. 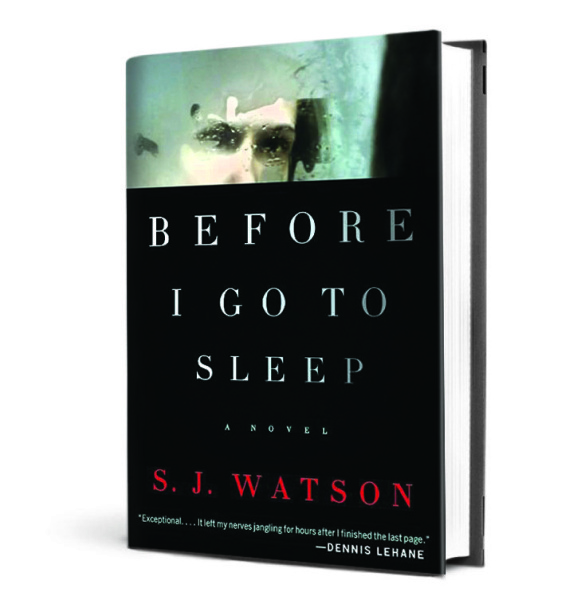 Watson is clever with her storytelling and introduction to her main character. Christine has suffered from a debilitating amnesia that wipes her short-term memory clean every night when she goes into a deep sleep. This has been going on for twenty years! She wakes not knowing who she is, who the man is in the bed next to her, not even how old she is. She wakes some mornings thinking she is still a child and sometimes no older than her mid-twenties. It’s a shocking moment, repeated every morning in the bathroom mirror’s reflection, when she sees a forty-seven year old woman, wrinkles, cellulite and all when she expects to see someone at the beginning of life. The cleverness I mentioned is how Christine starts keeping a journal to document her daily discoveries. At the suggestion of a doctor who wants to help her, but also study her and write a medical paper about her situation, Christine is able to wake, receive a phone call from this doctor who reminds her where she keeps her journal, and then read her own words and learn about what her life has become and what it was. She is told she loves her husband but is also warned of things that scare her. Before I Go To Sleep had me fearful for Christine and second guessing things in her journal. Unfortunately I started having a hunch of what the twist could be early on in the book, but I continued to second guess myself which was fun. I don’t like predictability in books. I want to be surprised, learn something new and be thoroughly entertained. This book brought all three of these things to me for the most part. 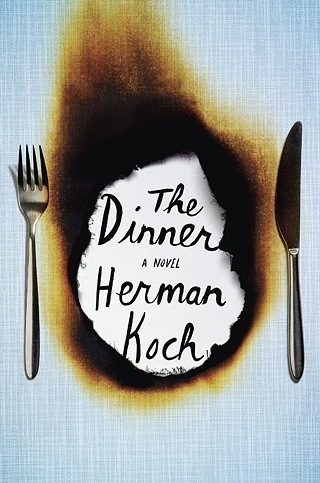 I learned that a film adaptation of the book is in pre-production. I hope it makes it to the big screen because, if done well, it could be a hit. Nicole Kidman is slated to play the role of Christine. Okay, well Nicole, let’s see what you could do with this character. It could be great! It’s Wednesday, so I was listening to one of my favorite podcasts, Books On The Nightstand, this morning while getting ready for the day. The topic in segment two that got the wheels turning in my mind was about whether you should “resist the lure of the new?” New books that is. Yes!! They are shiny and seductive but they cloud the view of those books that haven’t been read yet though they’ve been sitting on your shelves for a while now. There is nothing wrong with reading that new best seller. That hot title from that hot new author that all the bloggers are raving about and read advanced reading copies (ARC’s) of months ago. I was that blogger once. I feel like I pioneered the fan-wagon for The Art of Racing In The Rain by the wonderful Garth Stein. That book continues to make waves and it was published in May 2008. But because I read the new hot thing for so long, and more often than that book that slipped through my radar initially, I have missed out on some great books. I may own them already, but I never made time for them once I had them. I am working on correcting that problem. It’s not really a problem I guess. There are worse problems to have, but the fact that I have a library of half-read books is weighing on me. So, like I said in my last post, I did “go shopping” in my personal library of enticing titles. I will be seduced into reading some new books published in late 2012 and in 2013. I will just read! I won’t think about deadlines, or getting that ARC. It’s a freeing feeling for me and I love it. I’m almost done with my first read of 2013 and let me tell you, I’m loving it. I’m not going to tell you what it is till I review it but I hope you will check it out and add it to your “flew past my radar” list. I also want to share with you an upcoming read-along hosted by my friend Tina at BookChatter.net. The read-along will start April 1st and the book will be The Wind Up Bird Chronicles by Haruki Murakami. I have not read anything by him, though I own a few titles already, so I’ll be reading along with Tina and her blog followers. Now that I proofread this post I realize that it’s all over the place, but that’s okay. I’m still feeling a bit scattered but I am getting a grasp on things again. Blogging/writing, like reading, is a muscle in the brain. (Thanks Tina for reminding me of that!) I know I’m on the right track to getting back on the blogging/reading wagon. It won’t happen overnight, but it’s happening. Thanks for coming back to Planet Books or for visiting for the first time!